"Las Palmas Port is connected to 180 ports throughout the five continents supporting the traffic of more 30 shipping line vessels ..."
Las Palmas port, also known as La Luz Port or La Luz and Las Palmas Port, is specialized for several maritime industries, fishing base, merchant fleets, cruise and passenger fleets along with a nice marina port. It is located in Las Palmas city, Gran Canaria one of the Seven Canary Islands. 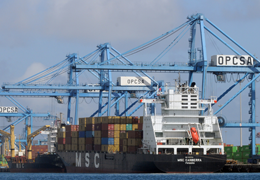 Las Palmas port belongs to the network of ports of the Spanish State and it is managed by Las Palmas Port Authority. During the last five centuries, Las Palmas Port has gained its deserved consideration as an important call port for general supplies, bunkering, repair, docking and others for any sort of oceangoing vessels South and North bounds in a strategic crossing in the middle of the Atlantic Ocean connecting three continents: America, Africa and Europe. Las Palmas Port is connected to 180 ports throughout the five continents supporting the traffic of more 30 shipping line vessels with cargoes, cruising, fishing bases, crew changes, general overhauls and any sort of technical repairs at this crucial sea locations making Las Palmas Port had grown with the major professional services and excellent installations. It is actually remarkable the growth of cruising industry in the touristic season with major number visits in the last few years. Originally, the port of the city was located at San Telmo in the mouth of Mata gorge, very close to the initial settlement of the Castilian conquerors. International navigation growth and European colonial expansion throughout Africa and American continents among others were key factors in a rapid development of the port works whose construction began in 1883 by the so called Port of Refugio de la Luz in La Isleta Bay that lasted 17 years. 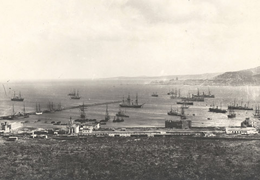 For around 100 years both ports were coetaneous and sharing the commercial port activity until 1970 as the huge land movements for the construction of the actual Avenida Maritima occupied and left under tons of soil and stones the old Las Palmas Port. As a result all the commercial operation was diverted to La Luz Port, original well know name in English. Years later, it was officially named Puerto of Las Palmas. 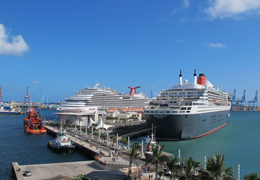 Las Palmas Port is located in Gran Canaria one of the seven island of the Canarias Archipelago, Spain at 210 kilometers from the African continent and at 1250 Kilometers from Europe.